Shakugan no Shana Wallpaper: Do you want to trick me? Minitokyo »	Shakugan no Shana Wallpapers » Shakugan no Shana Wallpaper: Do you want to trick me? Since a long time I want to make something for Halloween, and finally here we are. This Wallpaper needs 3 Weeks of work. ^^' The best think was to create the hats of the witches. and the pumkins. I love how you changed the colors, and how you added the hats and the pumpkins, really very excellent work, the vector is more than wonderful and clean! I love the touches you added, everything is done nicely =) and Happy Halloween! I like the changes you made. and the hats are wonderful and a nice addition =D I totally like them.. Overall, a very nice halloween wallpaper! They really look adorable! I really like the changes you made and it's very suitable for Halloween. Waaa I love your Halloween wallpaper :D! Thanks for letting me know! 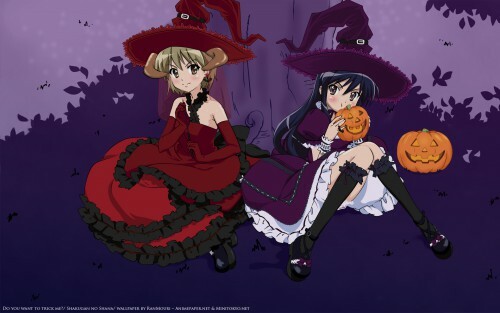 Happy Halloween XD! Wow this is great! I love the changes you made and I think you've integrated them really well. Awesome plz post more hallowwen pics! Very nice rendition! It was definitely very clever the way you manuvered the original.